‘Early bird catches the worm‘, is a wise saying that applies to entrepreneurs mostly. It is advisable to convert your idea into a reality before it gets stolen by others. 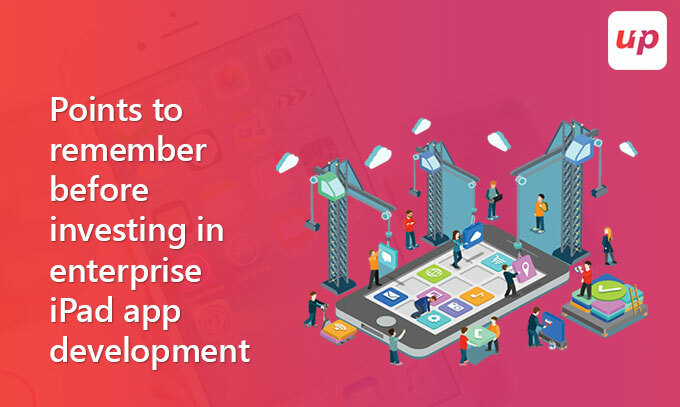 Likewise, if you are a mobile app developer then quickly proceed with the app development process before the same idea gives birth to unending competition in the app store. But any development process does not come free of challenges, especially if they are designed for any profit-making organization. Often employees such as the sales team mostly prefer using iPad over iPhones during their work hours and there are applications designed specifically to aid them in their work. However, iPad application development companies do face quite a few challenges while designing an iPad application. But the good news is they can be easily overcome if certain points are kept in mind before investing into an enterprise iPad application. Before we indulge in the app development tips, it is equally important to understand the benefits and challenges that underline any iPad app development service offered by a developer. Relieves the burden of carrying a relatively heavy laptop. Catalogues displayed to customers are instantly updated so that they have the latest information such as price, images of product, discounts, and other related details. Custom iPad application development exploits fine features of iPad such as database applications, barcode scanning, and printing, gaming and video conferencing helping the employees in their daily task. There is a rise in iPad requirement for enterprises which are robust in performances and security of sensitive data. iPad users are likely to consume heavy internet connection that exerts pressure on iPad app developers to consider minimizing battery consumption by the apps. iPad application development process relies on limited SQLite database for complex applications design. Having summarized the benefits and challenges of iPad applications, it’s time to consider the points that will guide you in making investment plans for iPad apps. Objective-oriented approach- A dedicated mobile application developer hired, through extensive research, must have enough knowledge pertaining to the target customers. It is important to understand the type of features and functionalities the users expect out of your application by stepping into their shoes and also the type of features that are required to accomplish the desired objective successfully. Based on this knowledge, build your application accordingly. Render a complete personalized experience- Your application must give a personalized experience to the users to drive conversions. Custom mobile app development process entails incorporating such features that serve the purpose accurately for which it is designed. After all, the employees especially the sales guys prefer to carry a device that can be used for presentation as well instead of a briefcase filled with scraps and files. Applications such as the projector, PowerPoint etc. can actually help your employees. Consider multi-devices and multi-users- iPad can never be compared to a personal computer or a laptop. Organizations such as restaurants have multiple users and hence the device must be flexible enough to allow users switch easily from one account to another, also feeding details on each and every user logged into the system. Syncing between devices is also possible here. Avoid impractical navigation- Enterprise mobile applications must have an official outlook. Hence it is your responsibility to make your hired app developer aware of this fact so that any fancy or eye-catchy navigations and UX/UI must be avoided by all means. It is advisable to stick to the standard features of navigation for enterprise apps. It is always advisable to hire a competent developer to aid you in your custom mobile application development process, especially if it is designed for your enterprise that requires extensive research and hard work. Get rid of the extra burden by hiring iPad developer who is dedicated enough to fulfill all the requirements pertaining to your enterprise mobile application development process. Also, the mentioned points have made it clear that iPad works best with the team than iPhone or tablet. So, if you have such a requirement then you know where to look for. Fluper, one of the top-rated mobile app development companies in Dubai, owns a well-equipped and highly skilled team competent enough in designing and developing applications for mobile, iPad and other such devices.